In September of 2013, Google AdWords made a leap toward transparency by including a yellow “Ad” indicator in the search engine results that were paid ads. Since that time, we have all grown accustomed to this new look on Google as we scroll down past the ads (most times) in our latest search for schools, stools, and shoes. 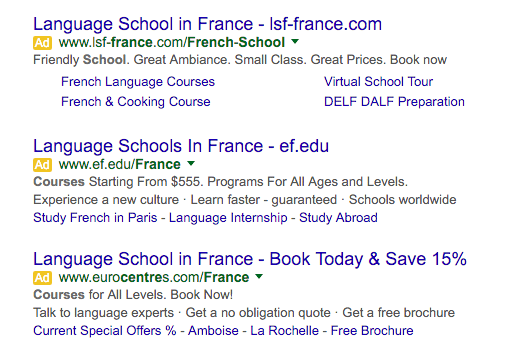 In April of 2016, Google began testing a modification to this look by changing the Ad indicator to green instead of gold. Yesterday, June 15, 2016, it became an official change. Ads are now green, not gold. Some key words in that quote from Google: test, feedback, easy. If any business knows how to execute an A/B test, it’s Google. And this is a perfect example of what an A/B test is. Seem trivial? Google doesn’t think so. We’ll never get to see that data, but rest assured Google Ads will get more clicks and advertisers will be getting more results with this enhancement. They vigorously capture and analyze feedback from customers to continue to make their product, Search (which is free), easier to use. This approach goes in contract to the trend in native advertising, which attempts to conceal an ad by passing it off as written or video content. And it’s even in contrast to Bing and Yahoo! 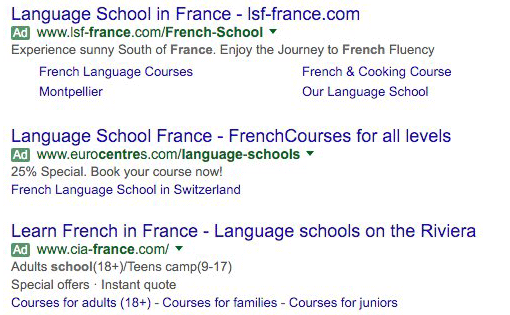 search engine results pages which use gray text to tell the user the results which are ads. It’s fascinating and inspiring to watch the search engine powerhouse continue to innovate and to defy what all others are doing. They believe in their product and know that customers crave transparency. Case studies on Google will be taught in universities for decades to come. 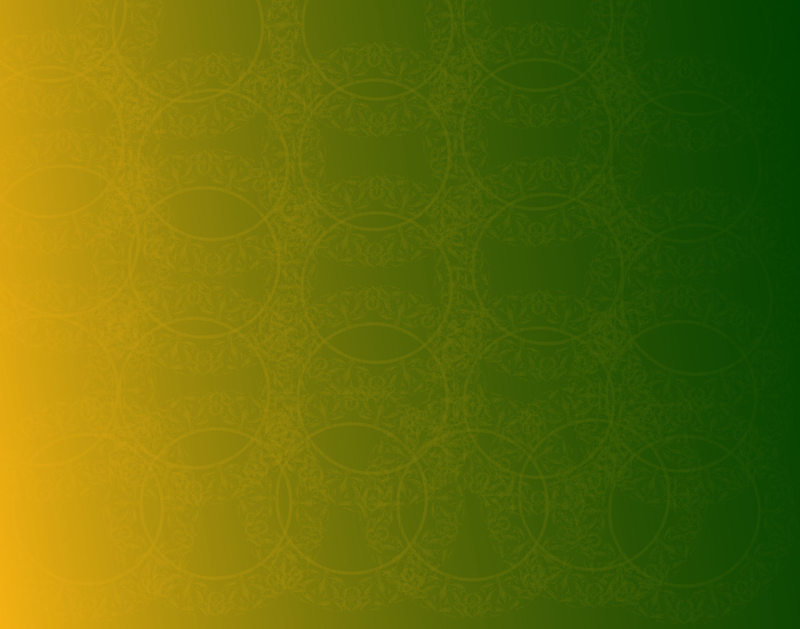 Side note: Green Bay Packers fans will continue to click at normal click-thru rates after the change from gold to green. It’s all the same to them! Take a moment to think of your absolute favorite brand. OK, now quickly think… why are they your favorite brand? Did it take you a moment to put your attraction toward that brand into words? We are naturally, subconsciously drawn to brands and products which share openly about themselves without even knowing it. Human behavior follows this trend in our one-to-one interactions, too. Even though we don’t like to think of ourselves as being judgmental, we’re making judgments all the time, every day. Picture these three different scenarios. A friend has brought you to a party in which you know nobody else except your one friend. 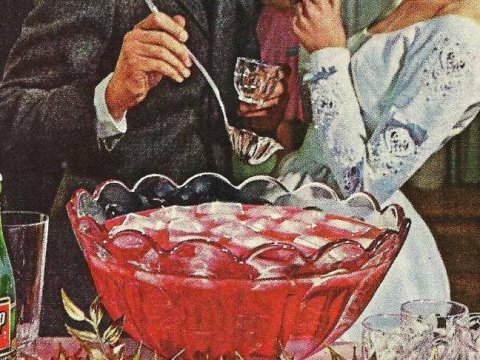 You immediately go up to the punch bowl (because your friend just ditched you at the front door to go talk to the cutie they’d planned on seeing at the party, so what else would you do?) and encounter another party-goer ready to fill his or her cup. Clearly response three is going to illicit the most engaging conversation between the two of you. Why? Because the party-goer opened up and shared a little more about themselves, which not only gives you some conversation fodder to work with, but it allows you to quickly assess whether you may have something in common with this person. Companies and brands are no different. 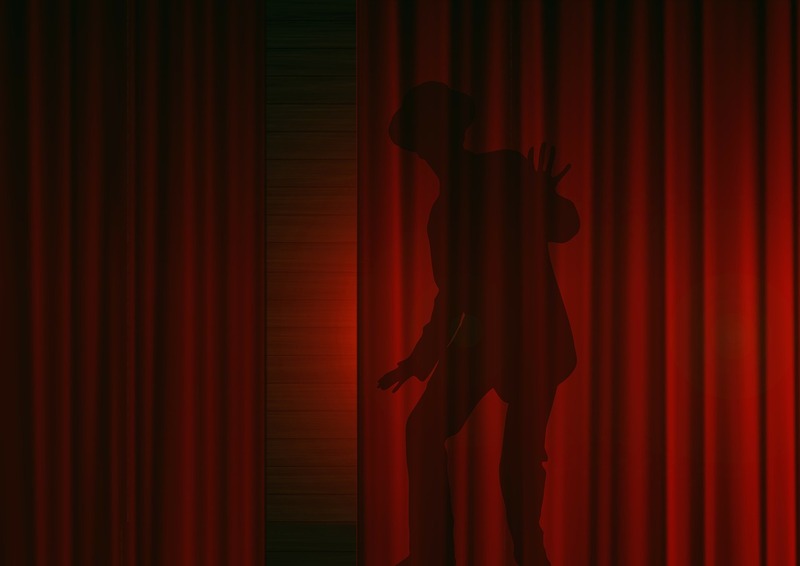 Letting people see behind the proverbial curtain, perhaps even sharing the ingredients to the company’s “secret sauce,” is not only trending in today’s marketplace, it can offer big rewards. Let’s look at some of the best examples of companies embracing the transparency movement. The food industry is probably the category in which transparency is most desired by the public. What do you care more about: where the iron ore in your steel bed frame came from, or what was in the cow’s diet that is now inches away from your mouth? I can think of no better gold standard for transparency in the food industry than Chipotle. Chipotle is a fast casual restaurant serving Mexican food. Their slogan or tagline could have been: The Fresh Taste of West-Mex (not horrible Taco John’s), Un-Freshing Believable (trying way too hard Del Taco), or What Are You Going to Love at Qdoba (really Qdoba, that’s the best you could do?). Instead, Chipotle management decided the company’s mission, not just a slogan, should be “Food With Integrity.” With a bold mission statement like that, they’d better live up to it, right? They do. Of the mere six tabs in the navigation bar of Chipotle.com, one of them is dedicated to the Food With Integrity mission. Within this page you see their philosophy on food in the kitchen, on the farm, and beyond with additional links for deeper information if the customer desires it. Of the three other Mexican food chains mentioned in the above paragraph, not one mentions anything about the origins of their food on their home page. Where will you be buying your next burrito? By now we’ve all seen how incredibly awesome GoPro footage can be. If you haven’t, please watch this GoPro compilation on YouTube by Washington Post right now. In GoPro-like fashion, Wendy’s produced a fun 1:20 spot in which we get to take a journey alongside their romaine lettuce, from farm to table. And you thought their salads just magically appeared out of the in-store refrigerators. Does this image look familiar to you? It’s fashionable to diss on the big dog; unless you’re from the northeast, no one cheers for the Yankees or the Patriots come playoff time. In fast food, McDonald’s is the global big dog. And admit it, at some point you have asked yourself, “How the heck do they get the supplies for all those Big Macs to every store, from downtown New York City to nowheres-ville-North Dakota, and get them tasting exactly the same?” So it’s no surprise it only took one image of questionable contents to ignite a rampant viral backlash against the fast food monolith. 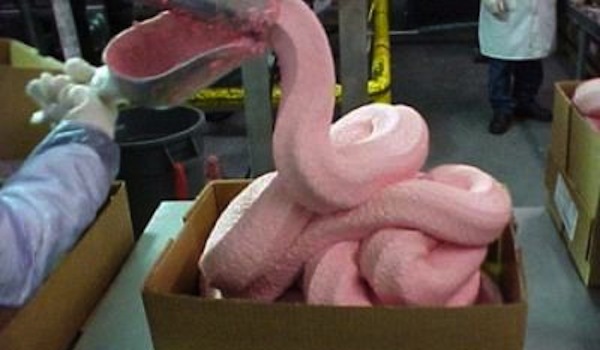 This thing went so viral so fast that the public didn’t even know if the alleged “pink slime” was supposed to be a beef or a chicken ingredient! What did McDonald’s do? It responded. 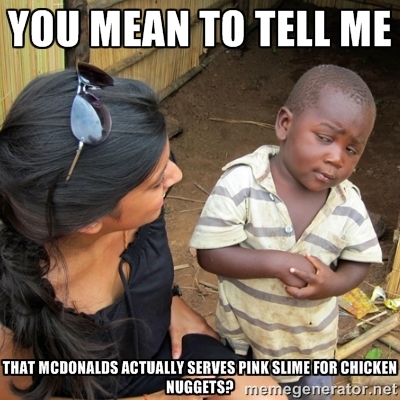 If you’ve ever wondered how Chicken McNuggets really get made, this video bares all. McDonald’s also has an entire set of web pages dedicated to letting their customers “See What We’re Made Of,” with information on their suppliers and common questions about their food ingredients, recipes, and processes answered. Gone are the days of keeping a little mystery in advertising. “Two all beef patties, special sauce, lettuce, cheese, pickles, onions on a sesame seed bun,” just isn’t cutting it anymore. People want to know what’s in the special sauce. So instead of being afraid that a competitor could replicate their recipe, McDonald’s embraced the trend and made the ingredients available for anyone who cares to see them. I’m just guessing here, but I’d venture to say McDonald’s isn’t feeling the hit from previously loyal Big Mac eaters who are now making their own Big Mac sauce. Restaurants and food companies aren’t the only ones hopping on the transparency bandwagon. There is more public demand for transparency than there is for foul-mouthed cartoons, legal drama, or Cosmo Kramer. Who knew? In a similar concept to How It’s Made, HowStuffWorks.com’s Stuff You Should Know Podcast has over 100 million downloads and almost 10,000 ratings, 4,000 reviews on iTunes. Ever wanted to know what really goes on at the FDA or all the secrets inside a can of SPAM? This podcast provides answers to satisfy your curiosities. We also are seeing transparency in the form of flattening organizational structures. Take the online retailer Zappos, for instance. This is a picture of the Zappos corporate office, courtesy of designleveraged.org. What’s interesting here is not the Hello Kitty balloon dangling from the exposed air ducts, nor is it the built-in whiteboard paneling on each worker’s cube, nor is it the Superman costume mounted on the wall. Every employee in this office has equal rank; no manager above nor below them. This approach is called “holacracy,” and it allows an employee to focus on tasks or projects as opposed to being placed in a silo and assigned to a manager. It eliminates a lot of bureaucratic red tape, allowing employees to focus on their work and have more of a stake in the direction of the company. Plus, no one wastes their time wondering/worrying “what the bosses are discussing in the conference room” because – there are no bosses! The Washington Post dives into the strategy in this article. Transparency can be an efficient operational strategy, too. Of course companies like Microsoft and Adobe profit from using their teams of engineers to develop robust proprietary software programs for which they can charge a premium. This is what they do. This method, however, is not the only way to develop a large-scale software program. On January 22, 1998, Netscape, the pioneering internet browser of its time, announced it would make the source code for its next release available to license for free. 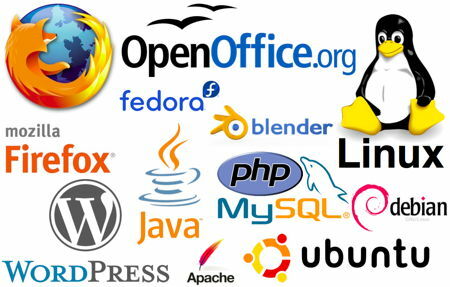 While this wasn’t the first instance of open source coding (where anyone can contribute to improving the code to make the program better or add functionality), this single event was the launchpad for large software companies to consider open source development as a legitimate method to build important programs. This event led to the eventual development of Mozilla’s Firefox browser, which you may be using to read this post. Heck, this entire blog is written on WordPress, which allows 3rd party coders to develop widgets and enhance the software. Neil Patel (founder of CrazyEgg.com) wrote a great post on the topic for FastCompany. Here are some of his points along with some of my own. Be transparent about both successes and mistakes. Give credit where credit is due; if you teamed up with a partner or vendor on a success, don’t hog all the credit. Own up to blunders, and explain how the company has learned from them. The public gets it – everyone makes mistakes. What the public hates (and the media loves) is when companies have been hiding their mistake until it gets leaked. Create a brand personality. Decide on voice and stick to it in your advertising, email marketing, and social posts. This can be as literal as using a celebrity endorsement to as simple as writing down a few bullet points (e.g. our brand is sarcastic, funny, and relatable) for your marketing department to use. A consistent voice gives your brand a tangible personality to which people can relate. Be transparent about less-than-satisfied customers. Have you ever been scoping out a product on Amazon, researching a car dealership, or searching for a restaurant that has 5.0 out of 5 stars with 100+ reviews? Isn’t that a little bit suspicious? Don’t delete bad reviews. Consumers can tell the difference from a legitimate complaint to an overly-hostile customer who has some ulterior agenda to get a freebie from the company if they bark loud enough. Instead, engage consumers who leave bad reviews to show them you care, which in turn shows the rest of the internet you care too. Tell Your Secrets. Your company has customers, stakeholders, fans. They do business with you and want to follow your progress. Let them in on what’s going on behind the scenes! Think about how excited a music fan is when they get to meet the artist after the show, and the artist tells them some personal nugget about “how they just wrote a new riff on the bus ride into town” or “how cool it was hanging out with Rihanna in-studio in L.A. last week.” This transparent sharing turns your followers into loyalists. Link Transparency With Sales. Cleveland Clinic is an excellent example of a healthcare company that has achieved bottom-line benefit from bearing all. Forbes’ contributing writer David Whelan covers the case study here. Essentially, Cleveland Clinic compiles all its Cardiology data into a report showing the overall outcomes of all procedures: successes, deaths, complications, etc. with various segments including physicians, times of day, and so on. They then share this report with cardiologists across the region, whose job it is to refer patients to a specialty clinic when their hospital can not meet the needs of the patient. Even though Cleveland Clinic doesn’t necessarily have the best results (some of their patients do indeed die), they have won large contracts from companies like Boeing specifically because they are open and willing to share their statistics. If your company can find a way to take a transparency campaign and link it driving sales, you have just stumbled upon a gold mine.